Carlos Torres prepares to lead off for the Teneroc Titans. 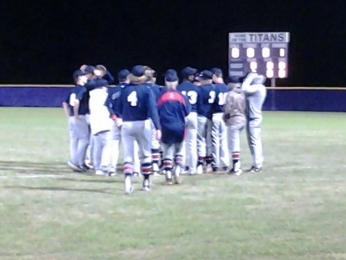 On a blustery, chilly night in Lakeland, the Tenoroc Titans held off visiting All Saints Academy 4-2 on Tuesday. Titans pitcher Bradley Jarvis did not give up a hit while picking up his first win of the season. It was his second complete game in as many outings, including his preseason action. Both Jarvis and Saints ace Blake Weirather looked strong through the first two innings, the only hit a single by Teneroc catcher Steven Beach. All Saints made solid contact off of Jarvis in the top of the fourth, but were shut down once again by flawless defense from second baseman Peyton Whitehend and center fielder Carlos Torres. The Titans (1-0) finally broke through for two runs in the bottom of the fourth. Third baseman Garrett Oliver reached on an infield error, then was thrown out by Saints catcher Barrett Williams on an attempted steal. Manny Torres then reached base on the Saints’ second error of the inning. Pitcher Bradley Jarvis helped his own cause with a one-out double, putting runners at second and third. Catcher Steven Beach then came through with a two-run single to put the Titans out in front, 2-0. 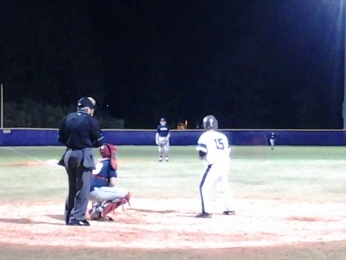 Beach would finish 2-for-3 on the night, with the two RBIs. All Saints Academy gathers before the final inning of Tuesday's game against Teneroc. All Saints failed to answer in the top of the fifth inning, opening the door for Teneroc to add to its slim lead. Carlos Torres walked to start the bottom of the fifth, then moved to second when Justin Hobbs was hit by a pitch. Both runners then moved up on a passed ball. Another errant pitch allowed Torres to score and Peyton Whitehend followed with an RBI single. After five innings, the Titans held onto a 4-0 advantage. The Saints (0-1) showed patience and discipline at the plate in the top of the sixth inning, forcing Jarvis to throw over twenty pitches while loading the bases and forcing in two unearned runs. Teneroc was unable to add to their lead in the bottom of the sixth. Bradley Jarvis returned in the top of the seventh to pitch a one-two-three inning to close out the game. Catcher Steven Beach, who contributed two hits and to RBIs, was asked to take over the catching duties because of an injury. When asked how he felt about being a catcher, Beach admitted he loved it. Teneroc will visit Lakeland Thursday night, while All Saints will be at Mulberry, also on Thursday night.